Yaquitepec (pronounced YAKeete-PECK and coined by Marshal South from “Yaqui”, the fierce freedom-loving Indians of Sonora, Mexico, and “tepec” referring to the hill) was Marshal South and family’s home from 1930 to 1946 on an obscure ridge they named Ghost Mountain, owned by the Bureau of Land Management before it became part of Anza-Borrego Desert State Park. Yaquitepec, where Marshal and family lived close to nature in an experiment in primitive living, was bathed in spring flowers earlier this month. 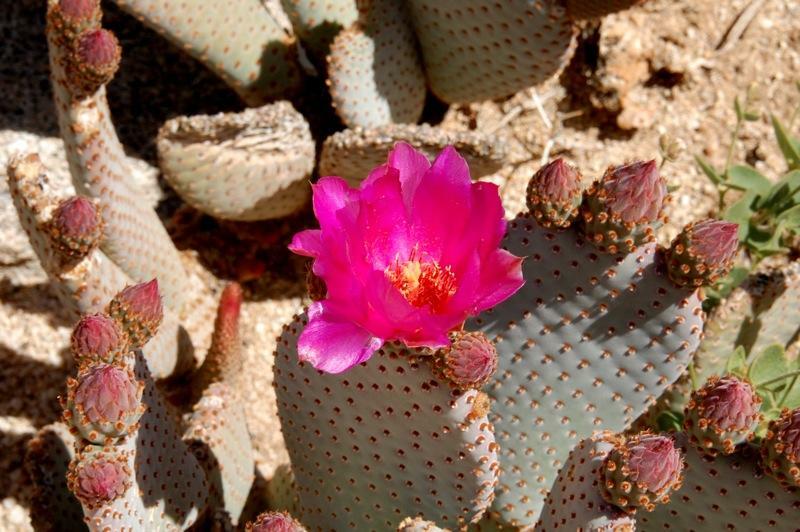 A beavertail cactus greeted us as we approached Yaquitepec after trekking up the 1 mile trail. 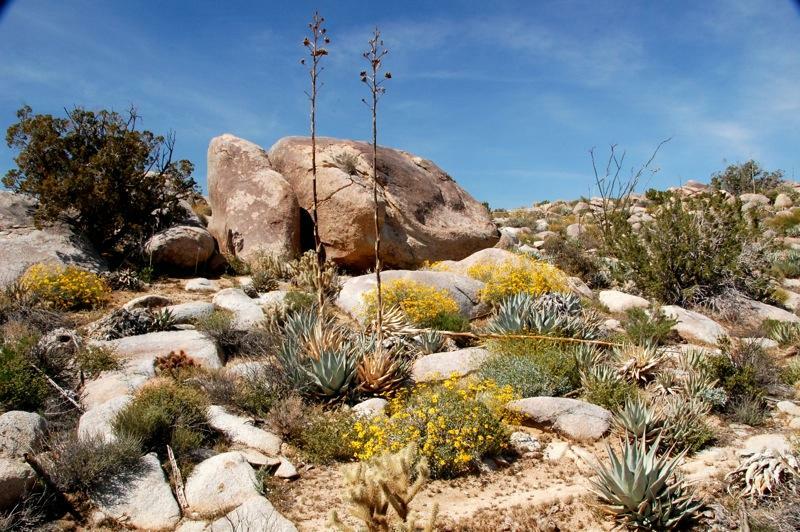 The squaw-tea [Mormon tea or ephedra] bush in front of the house is sprinkled thickly with clustering chrome-yellow blossoms; and down by the yuccas the white and yellow headings of my tiny desert daisy bushes nod beside the budding beavertail cactus. 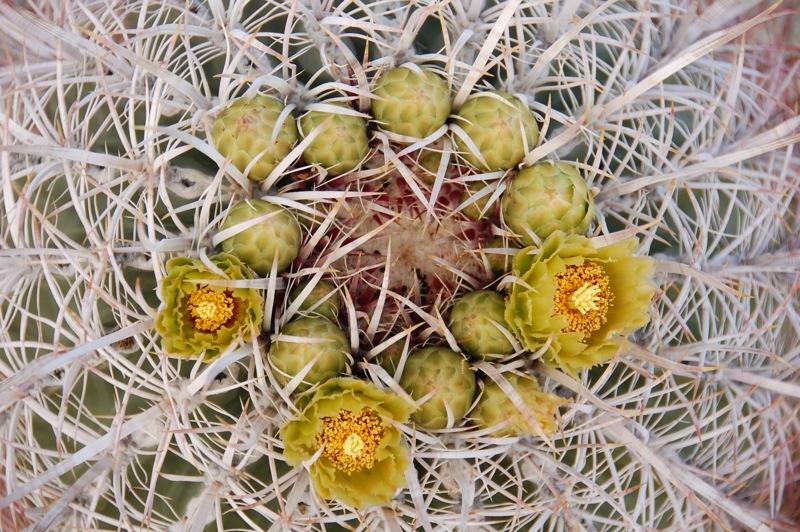 The barrel cacti too are crowned with flower circlets and the lone creosote bush by the great rock is already dressed in its bright new covering of varnished green leaves and is sprinkled with yellow blossoms. New pink and cream heads nod on the buckwheat. 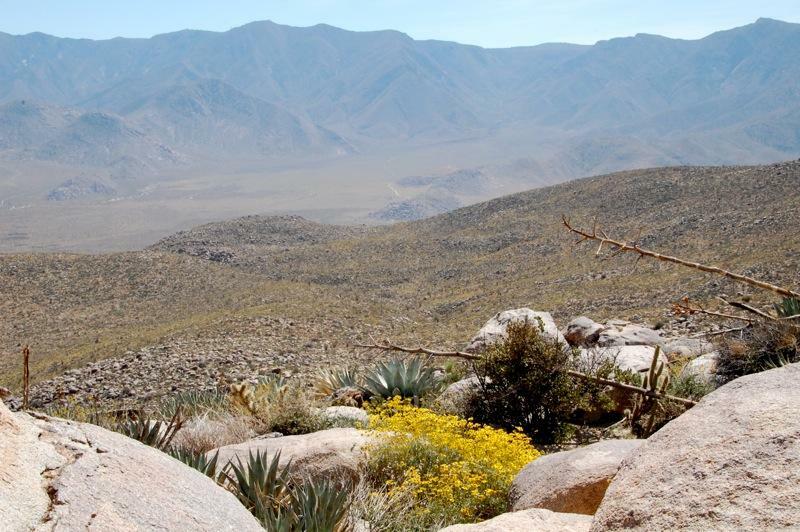 The whole world of desert growth throbs to spring. Ephedra funerea, Mormon tea bush, has tiny leaves and most of the photosynthesis takes place in its green jointed stems. 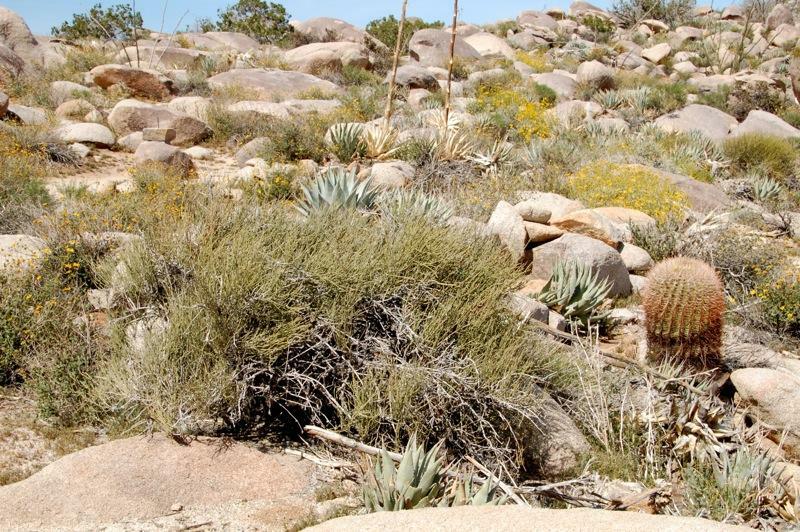 Most Native Americans in the Southwest and some of the Mormon pioneers brewed or boiled the Ephedra stems to make a tea that was considered refreshing and therapeutic. 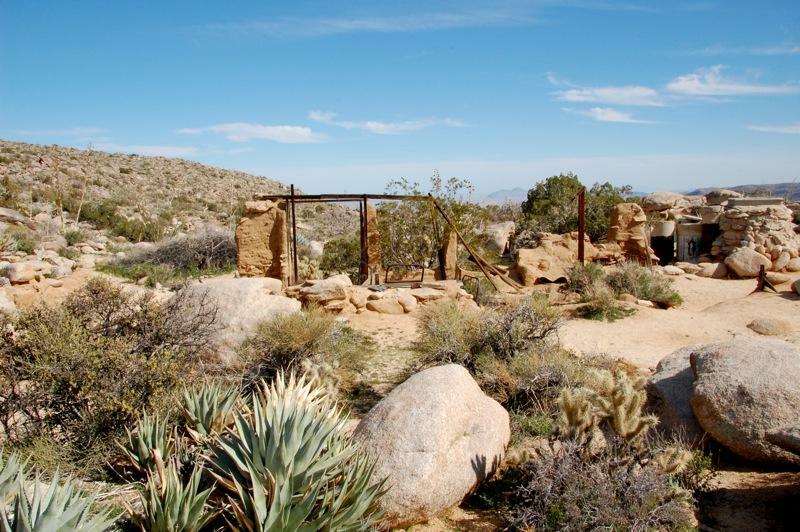 Marshal’s ephedra, which he called squaw-tea, was just a few feet from his front door. Last night was warm and at midnight I went out to open another shutter of our screened sleeping porch… I did not at once go back into the house. 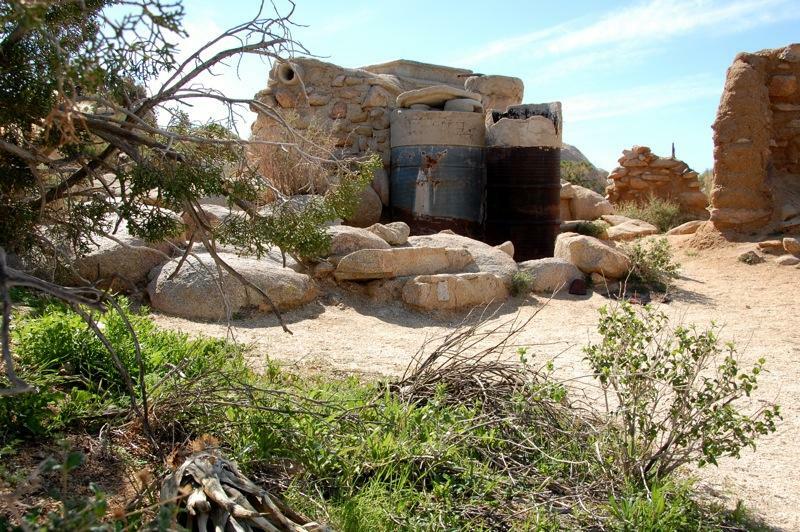 Instead I sat down on the upper of the two rock steps that lead past the cisterns to where the woodpile is. 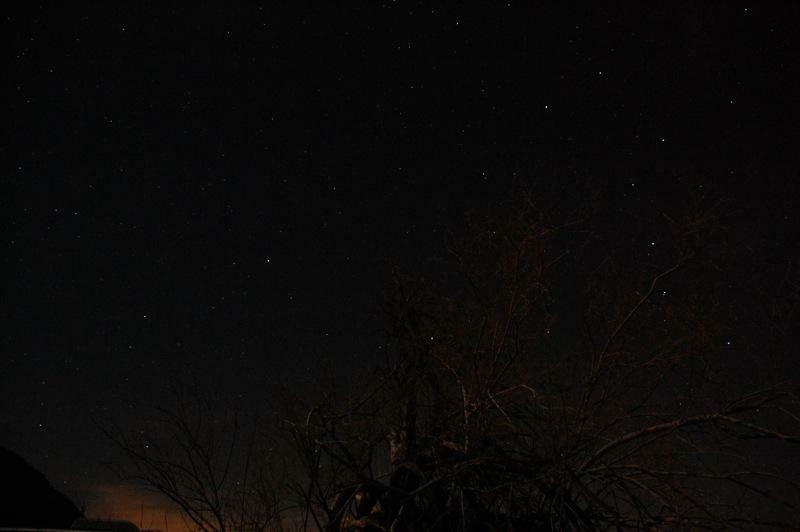 Upon my bare body the chill of the night air struck with a tingling, electric glow that was almost warmth. 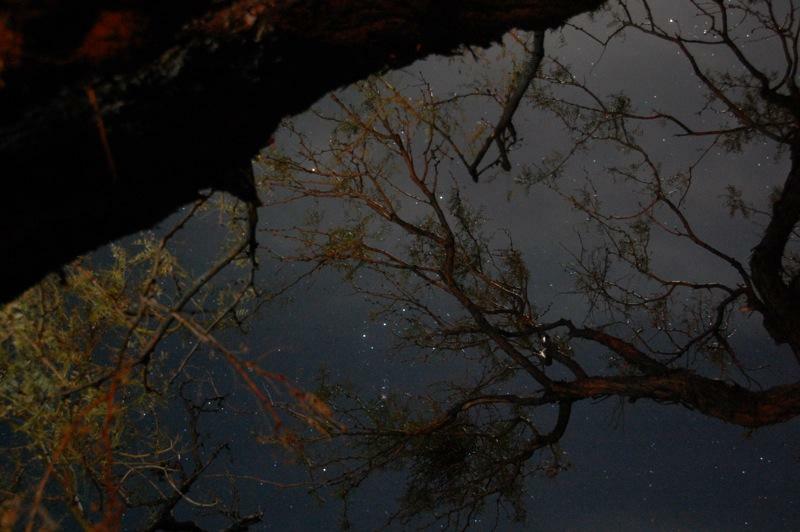 The night air was like a garment of peace, and the overhead arch of the desert stars, appearing and disappearing through rifts in the canopy of haze, was a glorious procession of the Heavenly Hosts, streaming forward triumphantly across the fields of Paradise… One gets very close to the heart of things, sometimes, in the desert silence. Plans were already in place for us to spend four nights just below Ghost Mountain, so when Rich L. and family arrived in Anza-Borrego Desert State Park with their friends Adam and Susan earlier in the week we were poised to go on a joint hike with them and celebrate their last full day in the desert with a sumptuous feast prepared by Larry. We had already agreed on a hike to see the pictographs near Ghost Mountain and I was especially interested in seeing the nearby morteros for the first time. 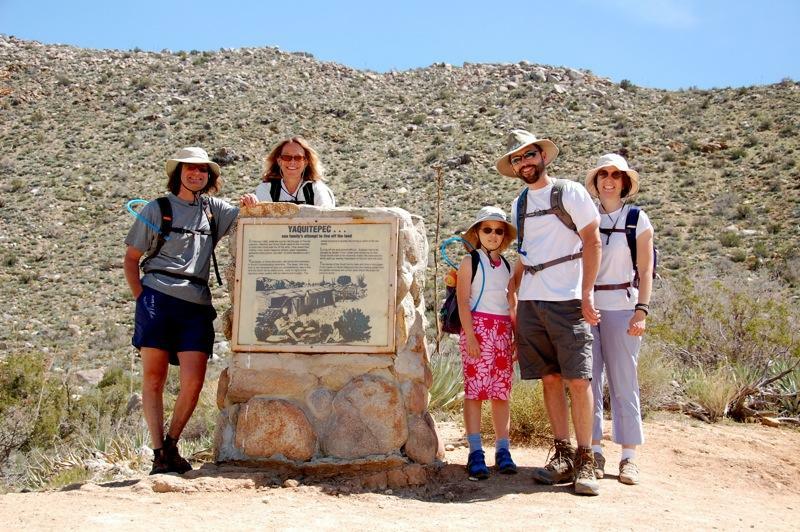 Adam and Susan had recently viewed the short film, Ghost Mountain – An Experiment in Primitive Living, shown in the Anza-Borrego Desert State Park’s Visitors’ Center, and they were interested in hiking up to see Marshal South’s former home site, Yaquitepec, on Ghost Mountain. So we decided to do all three hikes in one afternoon. 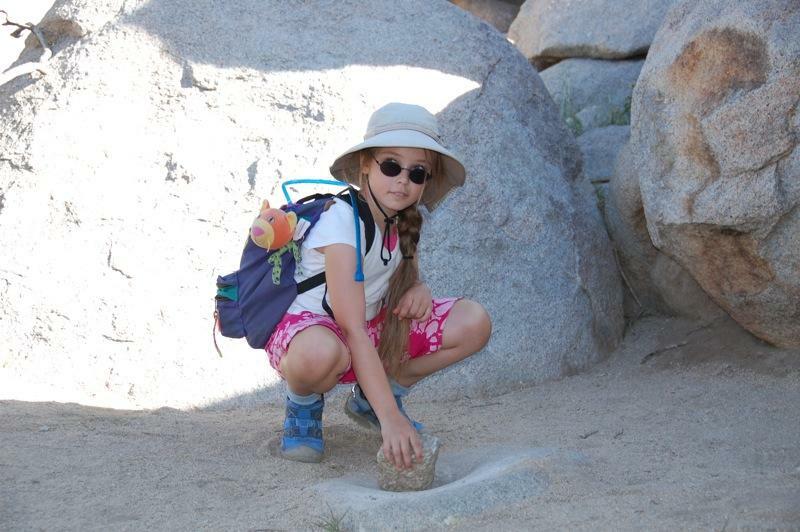 Zoe the cat enjoyed viewing the sites from the vantage point of Emma’s day bag while both Rich and Emma kept their eyes open for any curiosities along the trail. 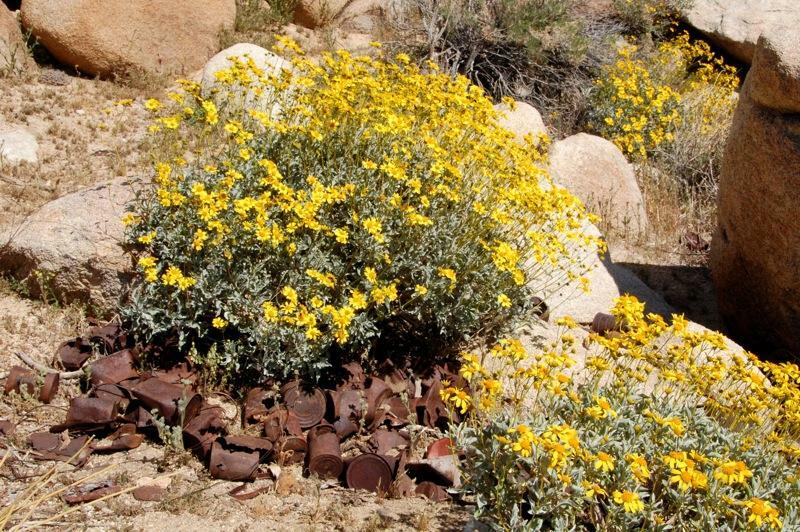 The Creosote Bush (Larrea tridentata) and the Brittlebush brighten Marshal South’s dissolving adobe ruins. 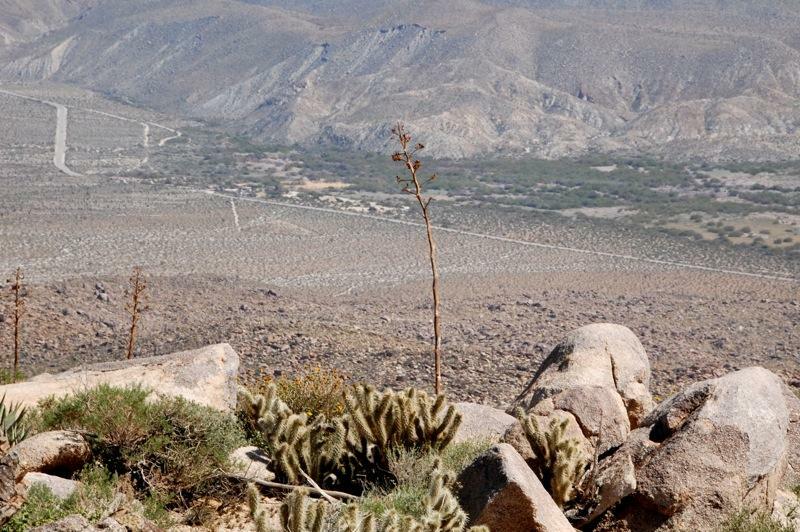 Desert Agave (Agave deserti) is also very abundant here. Standing below are two Agave flower stalks. 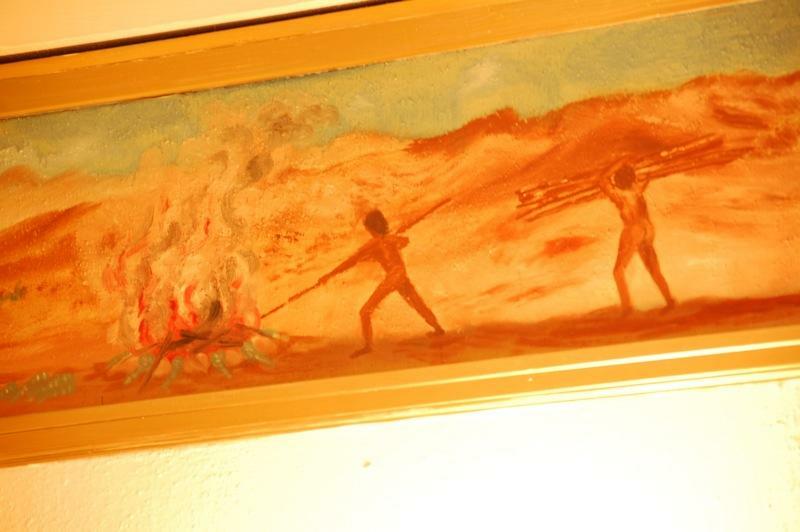 Native peoples (as illustrated in Marshal South’s frieze in the former Julian Library) once roasted young agave stalks in rock-lined roasting pits for two days which resulted in a sweet, molasses-flavored agave which was consumed. Mescal roasting is a family affair. Tanya and I find and bring in the sprouting plants that are ready for the baking. Rider helps dig the pit and fetches stones to line it. Rudyard and Victoria trot hither and thither, lugging in fuel… you leave your mescals cooking in their primitive oven for two days… Take a knife or a hatchet and carefully trim off the outer crusting, and the prize lies before you. Brown and golden and rich! 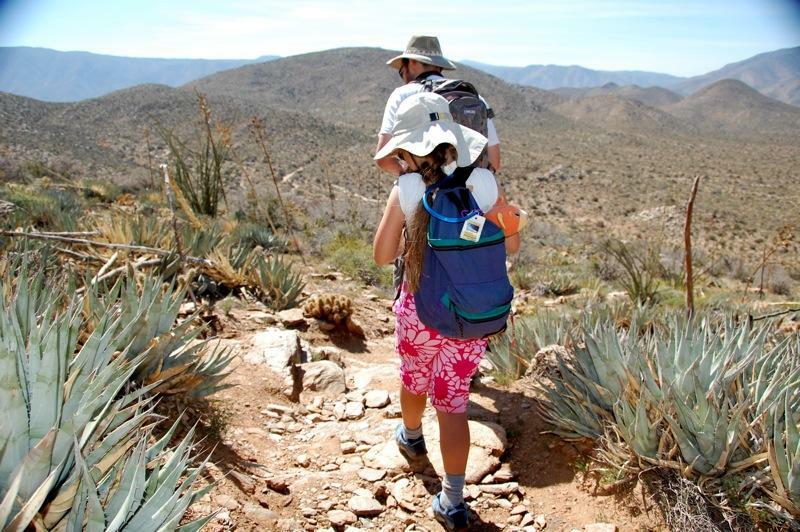 After hiking the mile back down to Rich’s Armada, we piled back in and continued down a sandy road to our next stop, Morteros Trail. 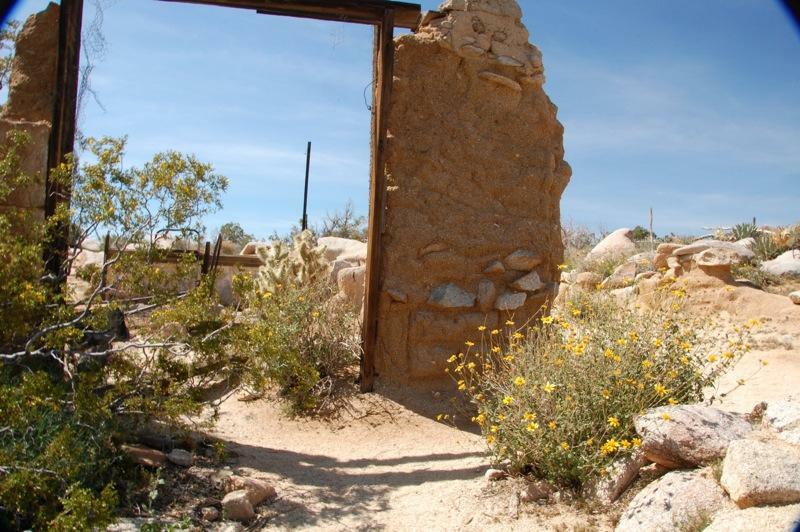 This .25 mile walk leads to an area where Native Kumeyaay women used rock pestles to pound seeds in the bedrock mortar (mortero). 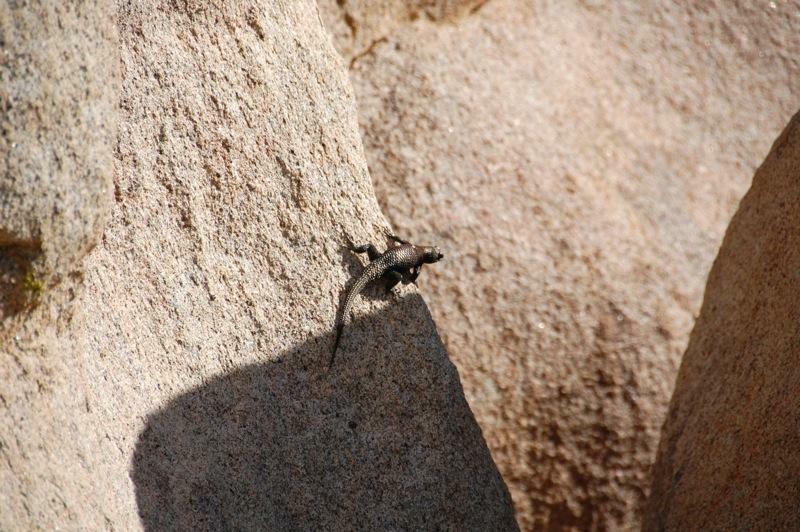 Along the way we spotted numerous lizards of various colors. 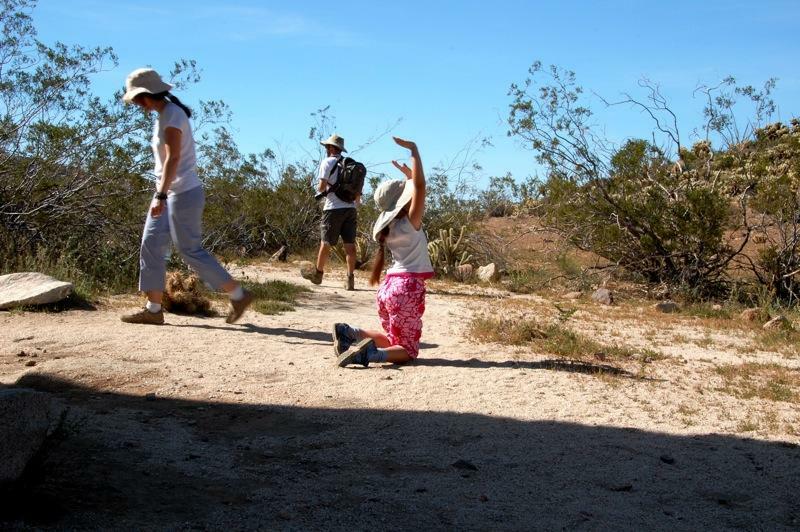 Emma wanted to see a large one so she performed her “Homage to the colored lizard” by repeated bowing with arms outstretched. 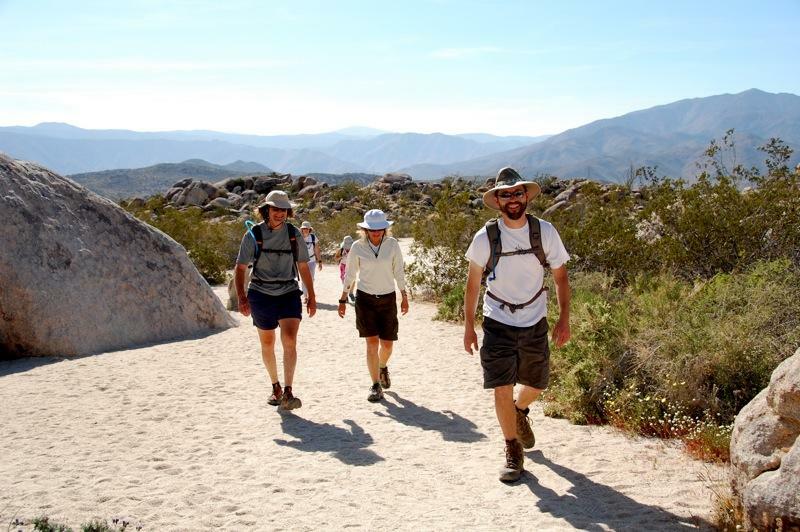 We then climbed back into the Armada and continued down the road to our next and final hike of one mile into Smuggler Canyon to see the pictographs. Emma’s homage worked because the next lizard that we saw was the largest one of the day. 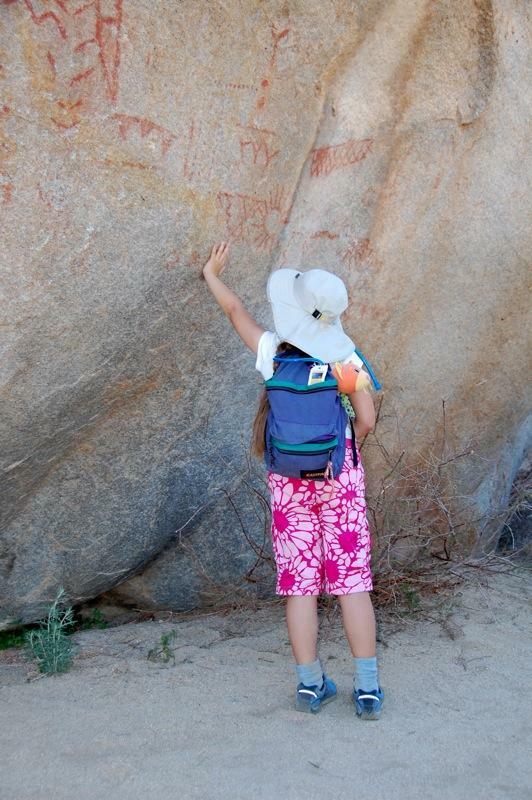 We found the rock art pictographs (pictures with applied color, as contrasted with petroglyphs which have pictures etched into rock) on a prominent boulder. 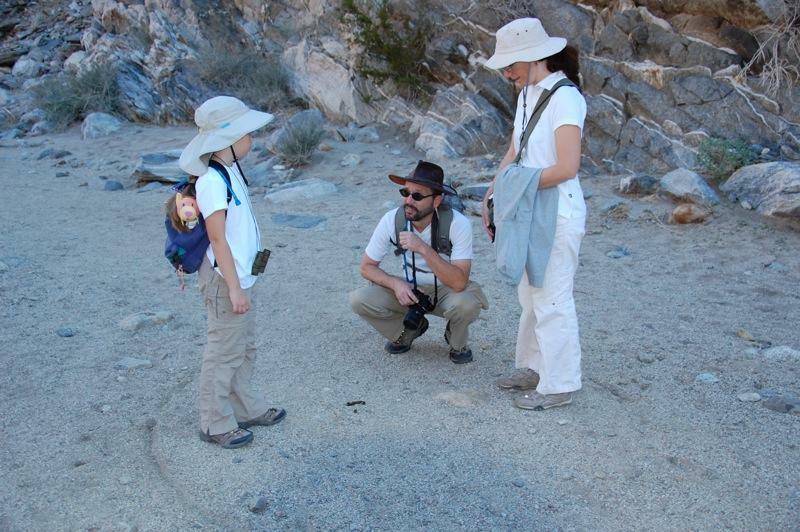 Manfred Knack says in his The Forgotten Artist – Indians of Anza-Borrego and Their Rock Art, 1968, Anza-Borrego Desert Natural History Association, this rock art may have been associated with girls initiation ceremonies… The diamond chain or “rattlesnake” may have represented a messenger from the god Chinigehinish (or Chinigchinix), who would punish those who disobey his divine laws… Paintings at the conclusion of the rites of passage reaffirmed the final lessons of the ceremonies. We were ready to find out what Larry had been preparing back at camp just southeast of Yaquitepec. In Larry’s own words: “Wednesday afternoon involved preparing dinner while Bill went hiking with our friends. A majority of that time was used to assemble the vegetarian pot stickers and cook the falafels. We found that another picnic table had been moved to our campsite. We aligned them end-to-end and set out a Mexican serape as a table cloth and hung 2 Chinese bamboo flutes with red tassels, which danced in the wind, on the branches of the grove of picturesque mesquite trees. This made for a festive ambiance with plenty of seating and a buffet table for serving. The weather was beautiful with mild breezes. Larry enjoys researching and preparing food, recipes, and menus that are inclusive and compatible with guests’ dietary limitations. I enjoyed the food and company so much that I forgot to take out our camera to capture the moment. Perhaps we can entice the Man In The Maze to post some of his shots of this dinner gathering in his next post.